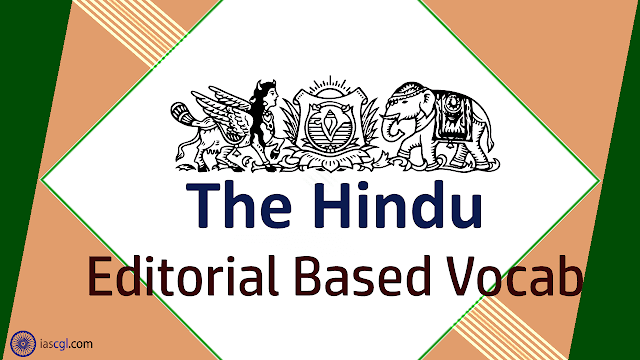 HomeVocabThe Hindu Vocab 21st September 2018 For Competitive Exams. The Hindu Vocab 21st September 2018 For Competitive Exams. Vocabulary from The Hindu Editorial 21st September 2018 for Staff Selection Commission(SSC) Combined Graduate Level, Combined Higher Secondary Level, Bank PO, Clerk and other state Government Examination. The joint visit of South Korean President Moon Jae-in and North Korea’s Kim Jong-un to Mount Paektu, the mythical birthplace of the Korean nation, on the last day of their landmark three-day summit is a forceful show of unity by the two countries. At the site, which falls in North Korea, Mr. Moon said the time would come when ordinary South Koreans “will come here on tours”, in a message of normalisation of ties. While travelling to Pyongyang earlier this week, Mr. Moon’s main goals were to revive the talks between the U.S. and North Korea over denuclearisation, and infuse fresh warmth into the North-South thaw. Given the agreements signed and the statements issued, the summit has strengthened the momentum for peace in the peninsula. During the meetings, North Korea agreed to shut down the Tongchang-ri missile-testing site in the presence of international observers, and dismantle the Yongbyon nuclear facility if the U.S. takes “corresponding measures”. The two leaders have also agreed to open a facility in southeastern North Korea where divided families can hold reunions. Mr. Kim has promised to visit Seoul at “an early date” for further negotiations. When that happens, he will be the first North Korean leader to visit the South since the armistice of 1953. The U.S. has responded optimistically to the summit, expressing readiness to immediately engage North Korea in talks. But it remains to be seen whether the positive atmospherics at the summit will yield tangible achievements on critical issues such as denuclearisation. Since the ice-breaking Panmunjom summit between Mr. Kim and Mr. Moon on April 27, inter-Korea relations have improved remarkably, while the U.S.’s engagement with the North has strengthened hope for peace. But while the two Koreas maintained the momentum through continued bilateral engagement, Washington and Pyongyang have failed to make much headway since the June summit between Mr. Kim and President Donald Trump in Singapore. The main problem is that though denuclearisation was accepted as a common goal, there were no specific steps or timeline laid out. It has remained more of a promise than a strategic plan. Pyongyang also wants the U.S. to formally declare an end to the Korean war before it makes any more concessions. But the heartening message from these engagements is that Mr. Kim appears to be consistent in his pursuit of peace and global recognition. Both the U.S. and South Korea should reciprocate and take concrete steps for lasting peace. Mythical: कल्पित - occurring in or characteristic of myths or folk tales. Revive: पुनर्जीवित - restore to life or consciousness. Denuclearisation: परमाणु मुक्त - to destroy or close nuclear plants. Infuse: पानी में डालना - fill; pervade. Thaw: पिघलना - a period of warmer weather that thaws ice and snow. Dismantle: विघटित -take (a machine or structure) to pieces.. Negotiations: वार्ता - discussion aimed at reaching an agreement. Optimistically: आशावादी - hopeful and confident about the future. Tangible: वास्तविक - perceptible by touch. Reciprocate: विनिमय करना - respond to (a gesture or action) by making a corresponding one.